Wednesday Class was decent yesterday (Ms. B is teaching summer intensive, so we’ve got a substitute whose name slips my mind right now, Ms. E); learned that my tombé-pique/step-over/lame duck was a little, erm, enthusiastic; dialed it back and got a double or two in. I basically always go into it like I’m going to do coupé-jeté en tournant. Or, at least, that’s how I was going into it. We had to do them slooooooowly yesterday – eight turns to super-slow music: pique, pique, pique, double pique; tombé-pique, tombé-pique, tombé-pique, double tombé-pique if you’ve got ’em. My petit allegro was slow, but that’s why petit allegro isn’t my strong suit. I need to work on that, always. Forever. It’s physics: pendulums with skinny ends swing faster than pendulums with fat ends, and I have freaking huge ankle bones. My ankles exist, now, but they’re not what you’d call skinny. Wasn’t sure if a thing in grand allegro was temps de puisse or coupé-balloné (edit: it was temps de puisse; I just sort of blipped out somehow while our instructor was giving the combination); once my brain was un-confused, my legs kept trying to do both at once. Other than that, though, pretty good. 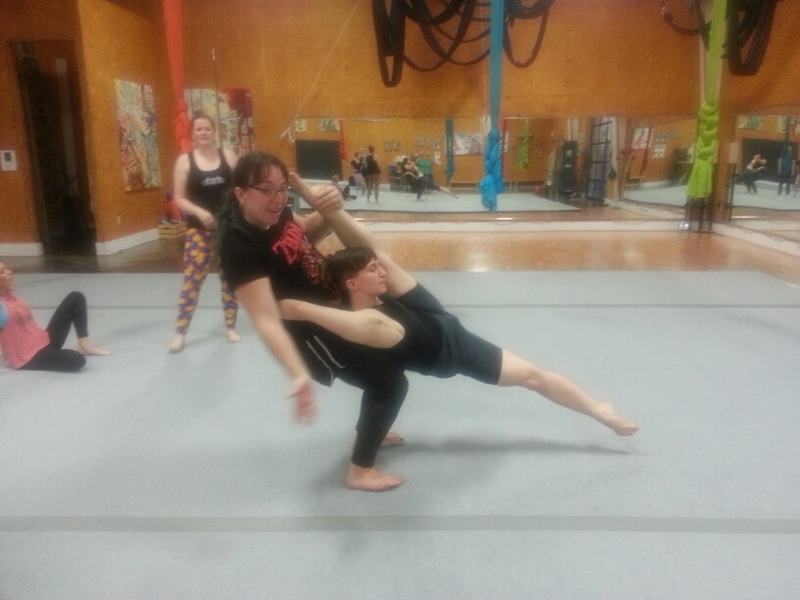 Tonight in acro we did a new thing called “lever,” which I fly like an ace because I have pretty solid splits. This month is Splits Challenge at Suspend. I’ve signed up in hopes of regaining hypersplits, heh. Posted on 2016/06/30, in acro-balancing, aerials, balllet, class notes, dance and tagged acro-balancing, lever, temps de what?. Bookmark the permalink. 2 Comments.